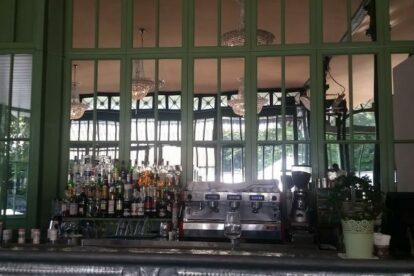 The Café du Parc des Bastions is an old green pavilion built in 1882 in the center of Geneva. Every time I look at it, I cannot help but imagine the people chatting and dancing there in their late 19th century clothes. It is such a lovely building, which fits perfectly among the trees of the parc des Bastions. The decoration keeps this vintage flair with red velvet sofas and sumptuous chandeliers of crystal. With its really central location, the Café du Parc is an ideal meeting point for a drink. If you have the opportunity I highly recommend eating there. The food is delicious and fresh, with many salads (CHF 15 – 20) and fish dishes (CHF 25 – 30). The Sunday brunch buffet (CHF 48) is also a good occasion to visit the pavilion before a stroll in the park. In winter, take a mug of mulled wine and enjoy the skating ring or the giant chess – one of the most popular attractions of the park.